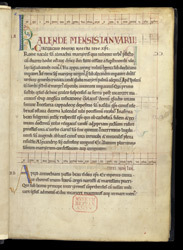 A martyrology was a collection of lives of saints (especially stories of their martyrdoms), lists of names and dates of death of members or patrons of a monastery arranged according to the calendar of feast days, and the 'Rule'--the guidelines for conduct and daily prayer, the most common being the Rule of St Benedict (benedictine rule). It was made to be read from during the meeting called 'chapter', which was held after early morning prayer (about 6 am) for the purpose of commemorating the dead and reading a chapter of the rule. After the reading, assignments for various tasks were made and any necessary punishments or complaints delivered. This martyrology belonged to the priory of Christ Church, Canterbury, and records the names and death dates of many of its monks, as well as those from its confraternity such as Glastonbury and Faversham. It begins with the readings for 1 January, the feast of the Circumcision. After giving some lore on the time of Jesus' circumcision, it provides stories of the martyrdoms of saints who are commemorated on that day: the 4th-century martyrs, Isidore of Antioch and three brothers Argeus, Narcissus and Marcellinus. The double horizontal bands across the page were drawn to hold the 'Golden numbers' and 'Dominical letters', which have to do with calculating the date of Easter and which week-day a feast falls on in a given year.